Lancashire's Toby Lester. Pic via YouTube, with thanks. 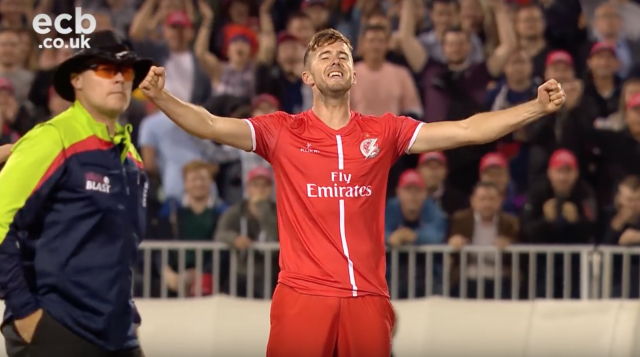 One man does not make a team but for Lancashire Liam Livingstone is, at least, a pivotal cog within it. His hand injury, sustained during the Roses Championship game, that is set to rule him out for a number of weeks is therefore a significant blow to the Lightning’s Vitality Blast hopes. Livingstone was a key factor in their strong start to the competition, winning five successive matches after losing their opener. It was a run of form that took the 2015 champions to the top of the North Group. 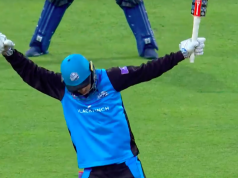 It is not just his batting at the top of the order, demonstrated with a blistering century at Derbyshire and an extraordinary onslaught against Yorkshire at Old Trafford, that Livingstone has been excelling in during the Blast. His spin bowling was a key weapon for Lancashire, as Friday’s opponents Leicestershire can attest. He claimed 4-17 in the reverse fixture at the Fischer County Ground as the Foxes were bowled out short of their allocated 20 overs. That defeat in front of the TV cameras will surely spur the Foxes on to attempt to exact some revenge on a Livingstone-less Lancashire at Old Trafford. The Lightning suffered defeat in the only game in which they’ve taken to the field since Livingstone’s absence, losing on the DLS method at Trent Bridge before enduring a washout at Worcester. That leaves Glen Chapple’s side second in the North Group having been leapfrogged by Durham on Thursday evening. It is still a much healthier position that Leicestershire find themselves in, however. Paul Nixon’s men are second from bottom having won three and lost six of their nine matches so far – they’ve played a game more than the majority of teams in the group. If Lancashire can adequately fill the hole left not only by their skipper’s absence but also by Keaton Jennings, who is with the England Test squad, then they will be favourites in this contest. But with the batting of their opponents significantly weakened, Leicestershire will fancy their chances of causing an upset. Alex Davies was dovetailing beautifully with his captain at the start of the competition, playing second fiddle at the start to the bludgeoning Livingstone before crafting his own innings. Now Lancashire need him to step up and take charge from the off. When scoring freely there are few better players to watch and he has the ability to kick-start the Lightning from the top of the order. After a couple of disappointing innings, Mark Cosgrove will hope to deliver for Leicestershire. The powerful and experienced left-hander is charged with accelerating the Foxes’ innings from his number three position and ought to enjoy what is generally a decent batting track at Old Trafford. Lancashire didn’t have to name their side against Worcestershire due to the weather, so it remains to be seen who will replace Keaton Jennings. Josh Bohannon is a contender to come in as an all-rounder down the order, with Danny Lamb another option. The Foxes have to bounce back quickly from defeat against Birmingham just 24 hours ahead of this clash at Old Trafford. It may be that Paul Nixon looks to freshen up his ranks. There’s a bit of weather around the North West but the bulk of it is set to miss Old Trafford. The pitch will be used for the Kia Super League game earlier in the day and so may be a little slow by the time this game begins. That could give spin an extra edge.